The share offer is now fully subscribed, and we are no longer accepting applications. This is an opportunity to buy shares in Reach Community Solar Farm Limited. The funds raised will be used to build a small solar farm on the edge of Reach village. Income from the electricity that is generated will be used to pay shareholders an annual interest payment on their shares and to make contributions to a community benefit fund. It's a great opportunity to put your money somewhere where it benefits the environment through the generation of clean, renewable energy; benefits the local community; and also returns some of the economic benefits to you! This page is a summary of the offer. The full share offer document is available as a PDF - please click on the cover image on the right to download it. You should read the full document before purchasing shares. Sorry - the share offer is now fully subscribed. We're no longer accepting applications. We aim to install just over 1000 solar panels on farmland on the edge of Reach village. The array is expected to generate sufficient electricity to power around 50 homes - approximately half of the households in Reach. The solar farm will require a capital investment of £340,000. This has come down from our original estimate, as we have received lower quotes for some of the components of the system. Income from the electricity generated will, after running costs, be used to provide annual interest payments of around 3 to 4% (although effectively rather higher where tax reliefs apply) to members and donations to a Community Benefit Fund. We hope in the future to be able to increase the array size to around 2000 panels. This will enable us to meet our original ambition of generating approximately as much energy each year as is used in Reach. It will also enable us to pay a higher return to investors of around 5-7%, and increase the donations we make to the community fund. 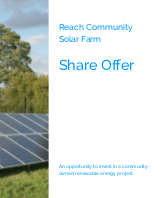 The share offer document details the opportunity to buy shares in Reach Community Solar Farm Limited. We are a Community Benefit Society with the express purpose of providing a benefit to the local community as well as a financial return to our members. This share offer invites you to purchase shares to help us raise the money to finance the development, marketing and capital costs of the project. Each share is worth £1. You may apply to purchase up to 20,000 shares. The minimum shareholding is 250 shares for residents of Reach Parish, and 500 shares for all other applicants. Shares will be issued in two rounds. The first £150,000 of shares should be eligible for SEIS tax relief (although this depends on meeting strict conditions, and cannot be guaranteed). The remaining shares should be eligible for EIS tax relief at a slightly lower rate. As of the 17th March, we have raised over £150,000, and so if you apply now you will receive shares in the second share issue. If the fundraising target is not achieved, and we are not able to raise other finance to meet the total required, the project will not go ahead and we will refund shareholder capital. If the applications exceed the required capital, the directors will distribute the shares as set out in the share offer document and in our Rules. If you are a UK taxpayer, shares you buy in the solar farm may be eligible for EIS or SEIS tax reliefs, which effectively give you a discount on the shares by reducing your income tax bill by between 30% and 50% of the value of the shares you buy. There are more details on our tax reliefs page. There is a minimum investment of £500 needed to qualify for the higher SEIS tax relief rate, although there is no minimum for EIS. You should note that as of the 17th March we have raised all the money we can under the SEIS scheme, so if you apply for shares now you should expect to get the EIS rate of tax relief. As Reach Community Solar Farm Ltd is a co-operative, each member will get 1 vote in how the business is run, irrespective of the size of their investment. The project will run for 21 years. You may apply to withdraw your shares during this period, but any such withdrawal is at the discretion of the board. Investing in the project should be considered a long term investment. All investments and commercial activities carry risk. By buying shares in Reach Community Solar Farm Ltd members should weigh up financial risk and reward as they would with any other investment opportunity. Those considering investing should do so only after reading the share offer document, including the section on risks. You may wish to consult a financial advisor before investing. At present the size of the solar farm we can install is limited by restrictions in the local electricity network. We orginally planned a solar farm with around 2000 panels - and our planning permission permits us a system of this size - but the export restrictions mean we can currently only install around 1000 panels. We expect the local electricity network to be upgraded within a couple of years however, and this may enable us to fulfil our original ambitions and install the remaining panels. If we are able to install 'Phase Two', we expect to be able to increase the rate of return to investors to approximately 5-7%, as well as significantly increasing the donations we can make to the community fund. Please note however that we cannot guarantee that Phase Two will happen, as upgrades to the local electricity supply are not in our control. You can buy shares online easily using the box at the top of this page. If you buy online you will need to make a bank transfer to our account for the full value of the shares applied for. If we are oversubscribed, you may not get the full value of the shares you have applied for (and you may get none at all). If this is the case we will refund any unused money to your bank account when the share offer closes. If we are undersubscribed, and the directors decide not to proceed with the project, no share issue will take place and the full value of your subscription will be returned. If you prefer, you can submit a paper application form along with a cheque. The application form is at the back of the share offer document.